Form, Art and the Environment: Engaging in Sustainability adopts a pluralistic perspective of environmental artistic processes in order to examine the contributions of the arts in promoting sustainable development and culture at a grassroots level and its potential as a catalyst for social change and awareness. This book investigates how community arts, environmental creativity, and the changing role of artists in the Polis contribute to the goal of a sustainable future from a number of interdisciplinary perspectives. From considering the role that art works play in revealing local environmental problems such as biodiversity, public transportation and energy issues, to examining the way in which artists and art works enrich our multidimensional understanding of culture and sustainable development, Form, Art and the Environment advocates the inestimable value of art as an expressive force in promoting sustainable culture and conscious development. Utilising a broad range of case studies and analysis from a body of work collected through the international environmental COAL prize, this book examines the evolution of the relationship between culture and the environment. 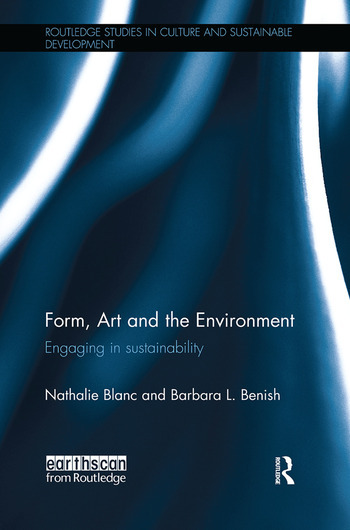 This book will be of interest to practitioners of the environmental arts, culture and sustainable development and students of Art, Environmental Science, and International Policy and Planning Development. Nathalie Blanc is Director of Research at Paris Diderot University, France. Barbara L. Benish is an artist and Founding Director of ArtMill: Center for Sustainable Creativity, Czech Republic.